Table No.21 - A Live Game with only one rule: ``If You Lie, You Die``. This movie revolves around a couple who live a mediocre life and are thrilled to have won a vacation to Fiji and their excitement increases when they get a chance to play a ``Tell all Truth`` game for a large sum of money. The game begins and the couple discovers that they`re not just playing for money but for their lives. 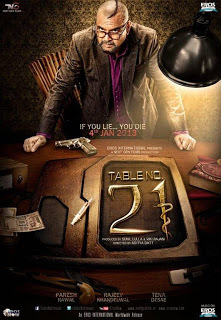 Eros International & Next Gen Films Production present `Table No.21` - A film directed by Aditya Datt. The film is produced by Sunil Lulla, Viki Rajani and features Paresh Rawal, Rajeev Khandelwal and Tena Desae in leading roles.